Taste test: These kettle-cooked chips showed a wide range of colors, from pale yellow to brownish, with some of the lighter ones also having browning around the edges. The shapes were irregular though generally quite wiggly. Amazingly, very few of the chips were broken, which suprised me, given the way that the bags were just carelessly thrown into a bin at IKEA. The taste was excellent, with the flavor of a baked potato, not greasy at all. But what stood out most was the crunch, which was just amazing. Take a typical kettle-cooked chip and take all the crispness but double the crunch, and you've got these. Smell test: Good rich potato smell, like a baked potato. 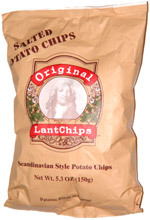 From the package: “Our LantChips Scandanavian style potato chips have been sold in Europe for many years. They are some of the best chips made over there. Thick cut, with a rich taste of potato, and a distinct flavour, influenced by one of the traditional Scandanavian ways of eating the potato, cut into coarse strips, fried in butter and eaten with lingonberry and also sour cream. A delicacy now, but long viewed as the poor man's food."